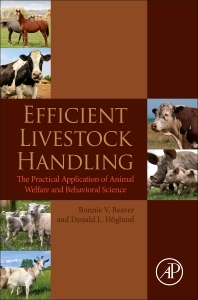 Efficient Livestock Handling: The Practical Application of Animal Welfare and Behavioral Science brings together the science-based disciplines of animal behavior and welfare to discuss how knowledge of one area (behavior) can be used to promote the other. Emphasis is on cattle and horses, but swine, sheep, and goats are also covered. Three major areas are included and integrated into a practical approach to working with the various species. Basic behavior as it applies to handling is discussed, with differences noted between species. The connections of behavior and handling are covered, and practical applications discussed, both with a liberal use of pictures and videos to bring the concepts to life.